ESTONIE – Kohtla Vanaküla - Archaeologists at a dig site in the town of Kohtla-Vanaküla uncovered what may be Estonia's largest known Roman-era sacrificial site on Thursday. Archaeology enthusiast Mihhail Stadnik discovered the site one month ago. Stadnik said the find came unexpectedly because he had been seeking Viking coins, but his discovery was much older, tracing back to the time of the fall of the Roman empire, reported ETV. The fast dig will be followed by a long analysis in research labs. University of Tartu archaeology professor Aivar Kriiska said one of the first things researchers will try to determine is whether the arrowheads and axe blades that were found have any remnants of wood. "We hope there is because then we can use carbon dating to find out their age. Then we will begin conservation and a comparative analysis. Every object must get a full comparison with similar objects from Estonia and neighboring countries," he said. The years from 100-500 A.D. marked the golden age and fall of the Roman Empire in Europe. The Romans even reached as far as Estonia - the end of the world, in their eyes. Kriiska believes the objects were most likely left by nomadic people at the end of the Roman Empire. He believes the ancient site was used for sacrificial purposes. IRAK – Kurdistan - The second season of archaeological research in Iraqi Kurdistan, led by Prof. Rafał Koliński from Adam Mickiewicz University in Poznań, has begun. The aim of the project is an inventory of archaeological sites located in the 3 000 sq km area on both banks of the Great Zab river in the plains lying at the foot of the mountain ranges of Kurdistan. 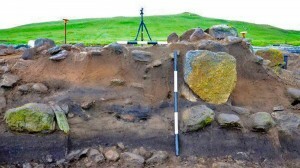 During the first season, researchers found 37 sites from the period between 6500 BC and 17th century AD. "Last year's activities covered the mountainous part of the area, where settlements were scattered. This year we will explore the fertile plain in the western part of the area covered by the concession. Analysis of satellite images allowed to locate more than 80 archaeological sites in the area, but certainly there are more ancient settlements in the area" - said Prof. Koliński of the Institute of Prehistory, Adam Mickiewicz University. ROYAUME UNI – Scilly - Research currently underway on the islands into Scilly’s earliest settlers is indicating that people lived here in the Neolithic period, as well as the Mesolithic era before that. A team of archaeologists are excavating around the Old Quay on St Martin’s as part of the Neolithic Stepping Stones project, which looks at how our ancestors made the leap, around 6,000 years ago, from hunting to farming. Duncan Garrow, a Senior Lecturer in Archaeology at Liverpool University, says they have unearthed more flints and pottery shards than they had expected to. And he says some fragments indicate that people were here in the earlier Mesolithic period too, up to 10,000 BC, which is a very interesting finding. Duncan says Neolithic people tended not to stay in one place but moved around the landscape, although the amount of flint found at the site suggests they visited the area again and again over this period. TURQUIE – Altıntepe Castle - A church, which was unearthed during the archaeological excavations in Altıntepe Castle in the eastern province of Erzincan’s Üzümlü district and dates back to the sixth century, cannot be opened to visitors since the ancient site does not have a watcher. The church, which is located in the eastern part of the castle and dates back to the early Byzantine period, has been waiting to be opened since 2011. According to sources, the Altıntepe Castle was built in the Urartu period and is located on a 60-meter hill in the northeastern part of Erzincan city center. The hill was significant center for the Eastern Roman Empire and has a church with three naves and mosaic ground. The church was built on a natural terrace and has a rectangle plan. 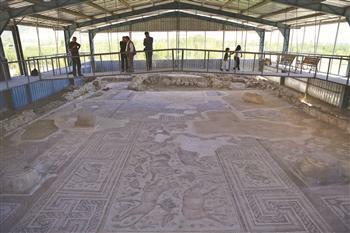 The color mosaic ground with various geometric, plant and animal figures is unique in the region. SRI LANKA – Delft / Neduntheevu - An archaeology website of Sri Lanka on Thursday claimed that the Maritime Archaeology Unit of the Central Cultural Fund (an exclusive Sinhala outfit of the genocidal State) had found a Brahmi inscription in “Sinhalese Prakrit language” at Delft (Nedun-theevu), the farthest inhabited island off the Jaffna Peninsula. The claim was based on a four-letter fragment found on a coral slab of the base of a possible Buddhist stupa, locally called Vediyarasan Koaddai. When it comes to Brahmi and Prakrit, many Sinhala archaeologists choose to forget ‘Sri Lanka’ but imagine ‘Sinhala,’ commented academic circles in Jaffna, rejecting the connotations with which the nomenclature “Sinhalese Prakrit” is conceived and is projected nowadays. The four-letter word, claimed to be in Brahmi script, has been found amidst scattered fragmentary writings and sometimes just single letters in Tamil script. Using scattered coral blocks, the ruined base was several times rebuilt in the past by Colombo’s archaeology department. According to the website, archaeology.lk, the writings in Tamil belong to 14-15 centuries [AD] and the Brahmi would date back to 1st or 2nd century [AD]. The Brahmi inscription had been written in “Sinhalese Prakrit language,” the website cited Rajarata University lecturer, Chandima Ambanwala, who is also the co-founder of the website. What was the ‘Sinhala’ element found in the four-letter word, differentiating it from any other Prakrit, if at all it could be read in Prakrit, asked academics in Jaffna. The whole thrust of the nomenclature “Sinhalese Prakrit” used by the Sinhala archaeologists, is to tell that the earlier people of the Delft island were Sinhala-Buddhists and Tamil has come much later. Delft (a name given by the Dutch, Neduntheevu in Tamil) is the farthest inhabited island off the Jaffna Peninsula but is the closest to the coast of Tamil Nadu. The place where the monuments are found is called Periya-thu’rai, meaning the big port, and that is the point from where the shortest passage towards Rameswarm in Tamil Nadu was made in the past. According to folk memory, milk and flowers for the temple rituals of Rameswaram were going everyday from Neduntheevu. The distance is barely 20 miles and wind directions favour quick navigation. ROYAUME UNI – Wilton - The circle was discovered in a meadow at Wilton, near Egremont by landowners Philip and Lyndsey Johnson. And according to Dr Terence Meaden, a research archaeologist from Oxford University, the stones could be over 4,000 years old. The formation was unearthed when the Johnsons began researching the history of their house. They came across an 18th century map with a drawing of the old stone circle in a field close to their home. It was marked “Druids Temple”. Further investigation showed the stones were probably moved by a farmer around 1800. The stones were found in a nearby hedge. The discovery attracted the attention of the Stone Circle and Henge Trust’s founders Professor Meaden and Paul Daw, who have been on the scene to aid in the reconstruction. Originally only three stones were discovered but, when more people got involved, the rest of the stones were found and removed from the hedge-line by a tractor. They have now been restored into a circle in the original field, at the spot where they were shown on the 18th century map.